SDRs are a lot of fun to play with simply as broad band receivers. I've used the regenerative receiver I built for some shortwave listening but that isn't even in the same universe of capability as a good software defined receiver. SDRPlay is significantly better than what you'll find with simple RTL-SDR dongles but costs around $150 as compared to $25 for the dongles. 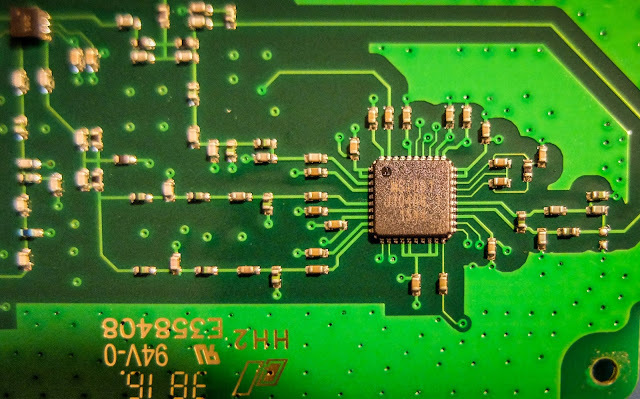 Since there are other reviews of SDRPlay out there so I won't go into details other than to mention that it offers continuous coverage from 10kHz to 2 GHz, has a 12-bit ADC rather than the 8-bit ADCs in dongles and provides up to 10 MHz bandwidth at a time. In addition to using SDRPlay as an incredible broadband receiver, I wanted to use it as a panadapter for my Ten-Tec Eagle. My Eagle is an early run model that does not provide an IF output or the circuitry to drive a panadapter. It is possible to splice into the Low Pass filter line of the Eagle with some minor surgery to provide receive antenna input to the SDR but if I did that the SDR could only be used when the radio is turned on and its receive bandwidth is limited to the Low Pass filter switched in the Eagle at the time. I didn't want that limitation or to have to keep switching the receiver's antenna inputs when I switched back and forth. So I decided to keep the receive antenna external from the Eagle. But to do that I had to protect the front end of the SDR from the transmitter or it would be overloaded and destroyed. There are a number of designs for protecting receivers from overload used in multi-station events. A common circuit is a bulb with two reversed diodes to shunt off extra energy. I considered building one but when I priced out the parts and a metal enclosure I decided to just buy one. I found one made by a ham in Slovenia (Aleš S59MA) that was reasonably priced and available on a famous auction site. 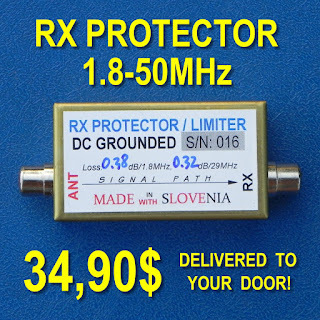 This allows me to use a receive antenna connected to the SDR with this protector in-line while I transmit on my outdoor antenna. That works but the panadapter display really lights up when I transmit and while the specs say everything should be safe I'll feel better switching out the receive antenna on transmit. I ordered a kit from OK1RP. The kit requires some extra parts (2x2N2222 transistors and 4x4k7 resistors) to complete that most hams already have but my junk box is pretty shallow so I ordered the 2N2222 transistors from DigiKey. The part specs are listed on OK1RP's page. Note that this relay defaults to the receiver output being switched off when there's no power supplied to the relay. The relays are so quiet I have to hold it up to my ear to hear it operate. The SDRPlay RSP1 comes in an unshielded plastic enclosure but I wanted to keep noise and near-field RF at bay. So I added layer of protection from near field RF by putting it in an aluminum enclosure. SDRPlay feeds IF/IQ to software defined receivers like HDSDR. That provides a way to view and listen to all that can be received by the SDR, not just ham bands but any signal from 10kHz up to 2GHz. But to use it as a panadapter for my Eagle I needed a way to control both HDSDR and my transceiver. OmniRig is CAT control software that simplifies software control of receivers and transceivers. It communicates through COM ports. The Eagle has a USB to serial interface that uses a hardware COM port but HDSDR is software with no physical COM port. HDSDR can be CAT controlled as well using either a Virtual COM port or DDE interface. So I created a Virtual serial port using VSPE software to create a virtual serial port "pair". 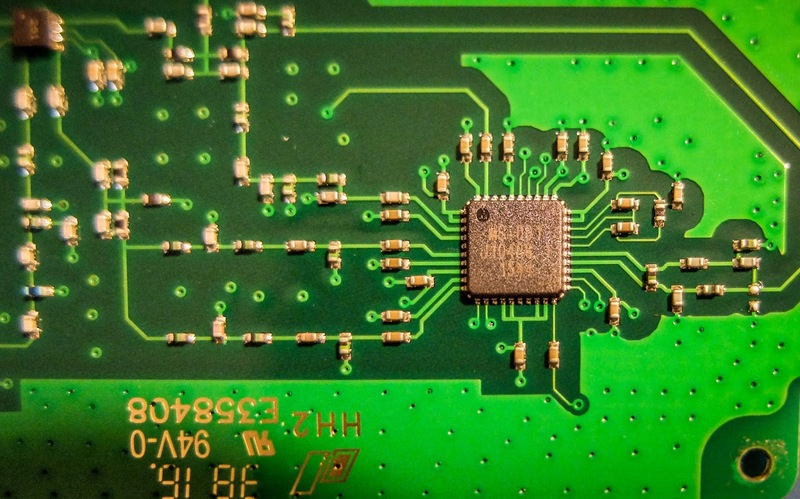 The first COM port is considered the INPUT from HDSDR. 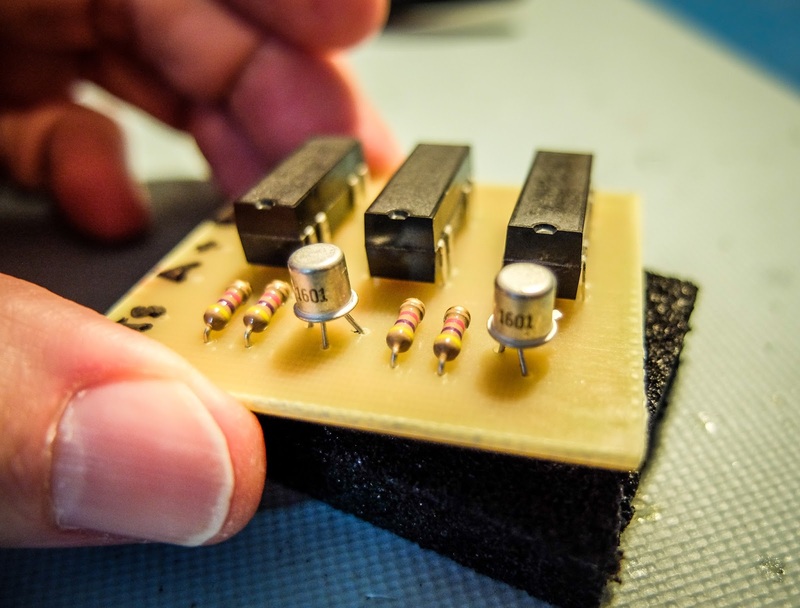 The second pair of the COM ports is the OUTPUT to be used by the listening application (OmniRig). OmniRig needs to know the "type" of "radio" it's talking to. HDSDR uses the Kenwood CAT protocol so I chose Kenwood when configuring OmniRig. HDSDR also provides the ability to synchronize the CAT traffic between two OmniRig connected radios. This ability to sync two rigs is the key to making this work. It syncs with the transceiver so that changes made in HDSR are sent via CAT control to the Eagle and vice-versa. SDRPlay can send up 10MHz of bandwidth to the SDR software receiver. That much bandwidth isn't terribly useful other than at the macro scale of seeing if there are signals. More typically I set the IF bandwidth to 2MHz which easily covers an entire ham band and use the zoom control in HDSR to narrow it even further. What's further, I can feed IF audio from what's being received by the SDR to programs such as CWSkimmer. 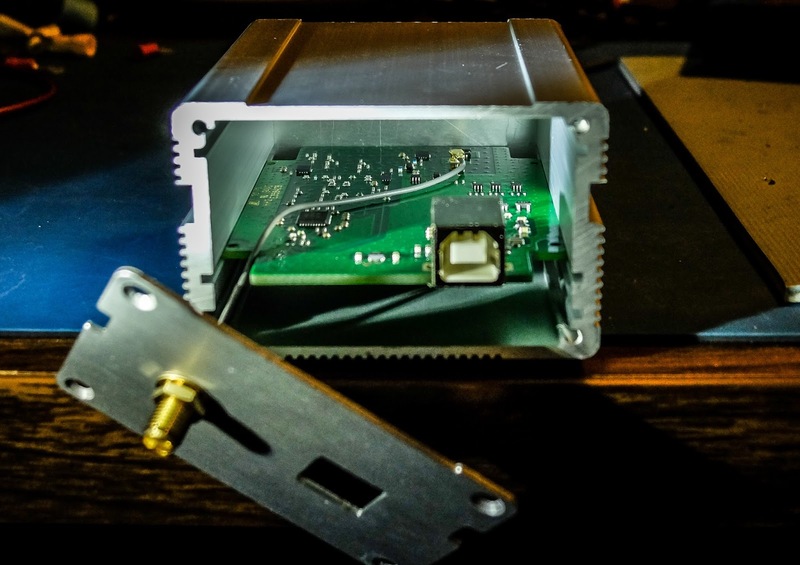 CWSkimmer has an interface for the SoftRock SDR to receive up to 192kHz. The issue was how to get the audio output from HDSDR to the CWSkimmer application. To accomplish that I use VB-Audio virtual audio cable to route 192kHz bandwidth of audio from HDSDR to CWSkimmer's SoftRock IF/IQ interface. CWSkimmer also has an OmniRig interface so that is configured to read the second virtual COM port pair from HDSDR. Thus I can control the Eagle from either HDSDR or from CWSkimmer and vice-versa, changing the VFO on the Eagle commands HDSDR and thus CWSkimmer to follow it. I use a similar arrangement with my FTDX3000. 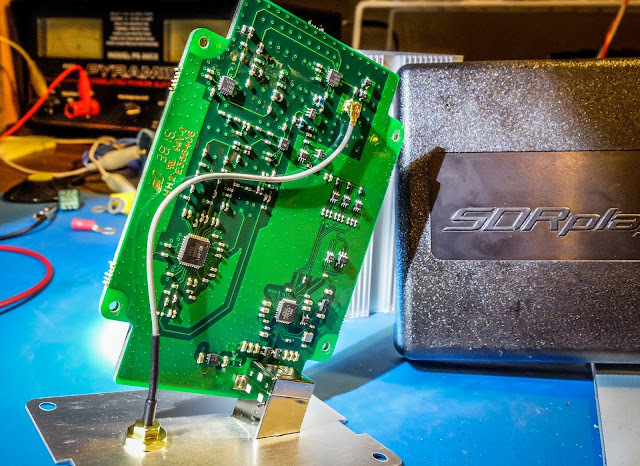 I conncted a Softrock RX II to the RX out port of the 3000, using it's TR switching internal switching circuit. I use VSE a serial port emulator,Omni Rig and HDSDR to complete my panadapter. With Omni Rig, I can control the 3000, an FT-450 and the RX II from any source. Love the point and click capability. Rich, I was wondering if you compared the SDRPlay before and after you put it in th aluminum enclosure. I have heard mixed reports. Right now, my transmitter will overload the SDRPlay (and it doesn't recover quickly) even though I have a QSK T/R switch in line. Dan, I didn't test the SDRPlay in the plastic enclosure but I am getting what I consider to be great results. It seems every bit as sensitive as my Elecraft KX3 receiver and is quite immune to noise. With the configuration I'm currently using it is not overloading the SDRPlay on transmit but I am using a very fast acting switch along with the front-end protector. Try a shielded USB cable with ferrite beads on each end. The metal enclosure is nice but didn't solve the problem.